Motion is a concept that has intrigued even the earliest humans. A bowl dating back 5,200 years was found during the 1970s in Iran’s Burnt City. On it, five sequential images were found on its surface—a primitive zoetrope that produced the illusion of a goat jumping once the bowl was spun. 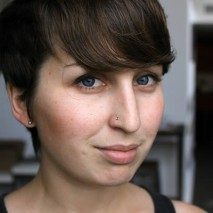 Since that time, creatives have tried to replicate motion through a myriad of applications and techniques. One notable pioneer was Eadweard Muybridge who used 12 cameras to photograph a galloping horse in a sequence of shots, breaking down the creature’s stance to prove that it lifts its feet off the ground while running. This is the basis for traditional animation, in which the illusion of movement is produced with numerous drawings that are each different from the last. 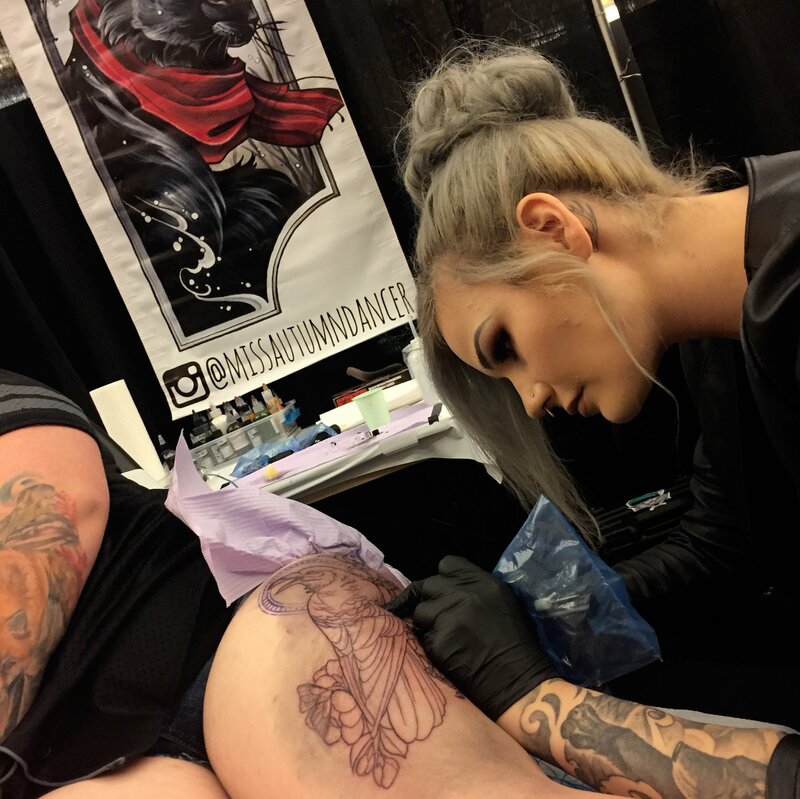 Today, people are still enthralled by making inanimate objects and drawings move—even in tattoos. 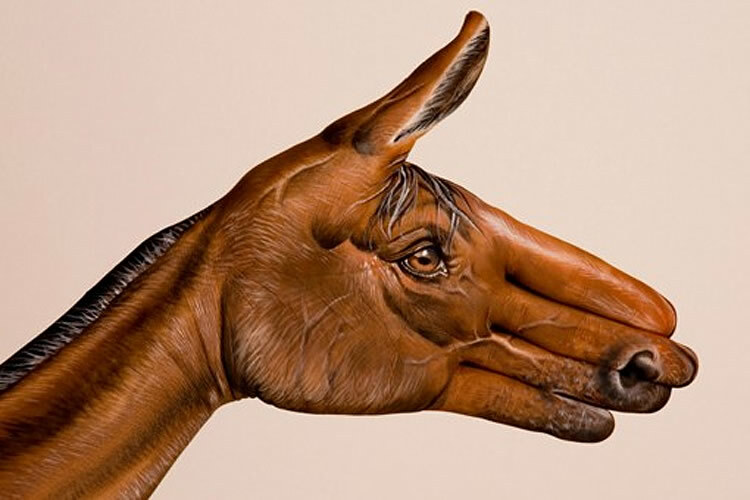 Although the skin seems like an unlikely place, artists employ different design techniques that make stationary images seemingly change before our eyes. 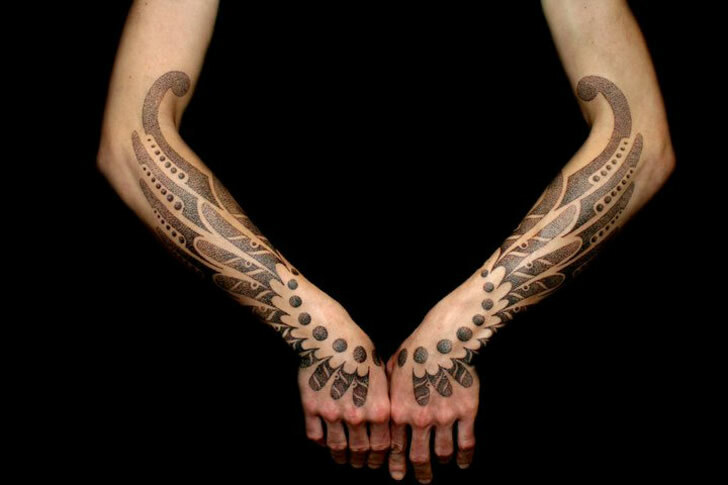 Above: Tattoos by Lewisink have elements of Op art designed into them. 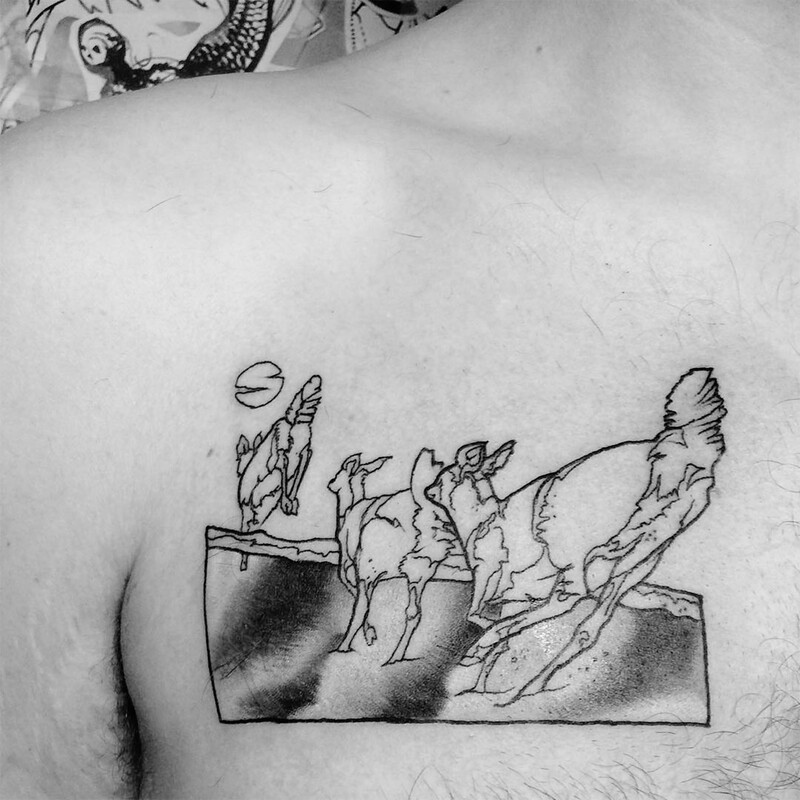 Vitaly Roy’s tattoo showcases a traditional animation approach. Artist Vitaly Roy is the epitome of traditional animation. Composed in one graceful motion, the slight, overlapping movements effortlessly flow from one shoulder to another. It’s as if all the 2D segments have been laid on top of one another. Much of Roy’s tattooing portfolio focuses on natural-themed imagery like this sprawling scene, but without the added feeling of motion. Gradient dot work and swirling lines draw our eye into an abyss. Okan Uckun first began tattooing with a larger idea in mind: to try his artwork on all sorts of canvases from walls to plants—and including skin. 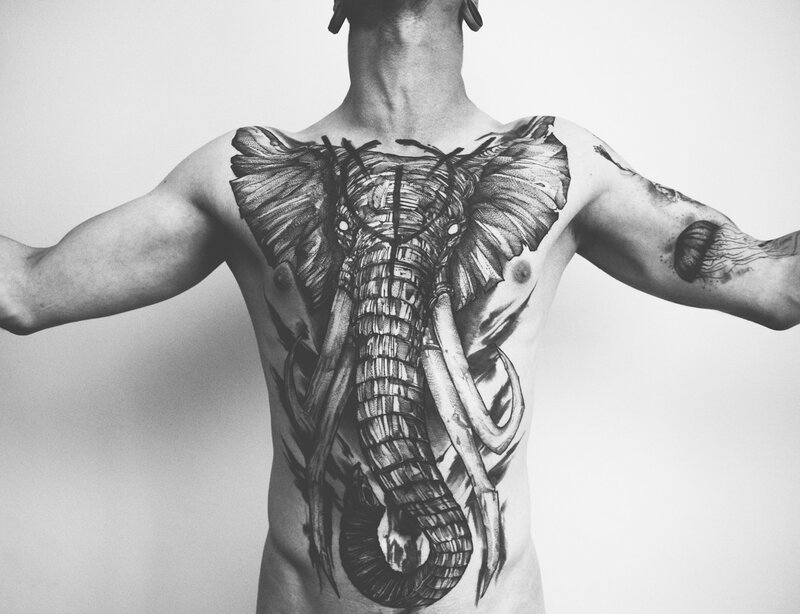 “Transferring them into the skin is such a different experience and quite more exciting,” he told Tattoodo. 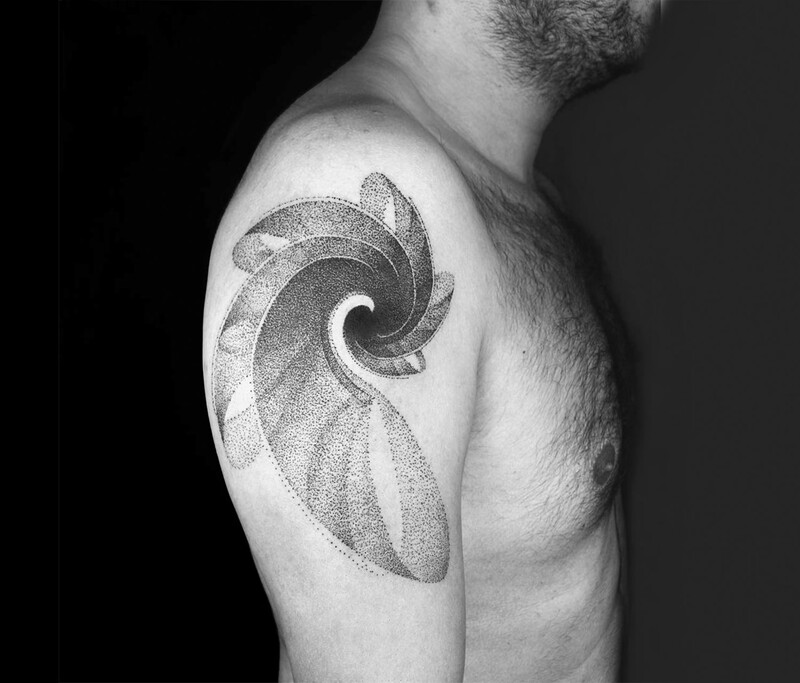 “For me, the surface on which your work moves, stays alive with the owner, travels and makes love, [is] the most satisfying [canvas] for the designer to draw on.” Here, he’s used swelling and warping to create the illusion of movement on the arm. 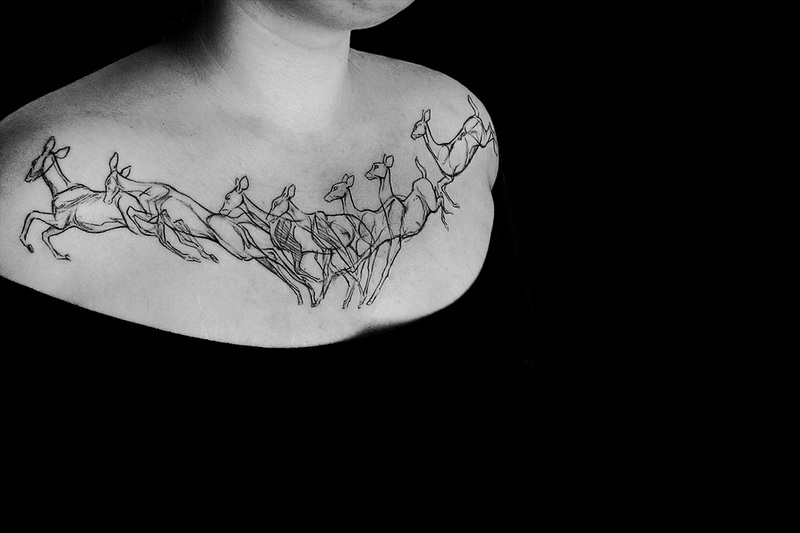 With a single line, Mo Ganji depicts the wind whipping through a horse’s hair. 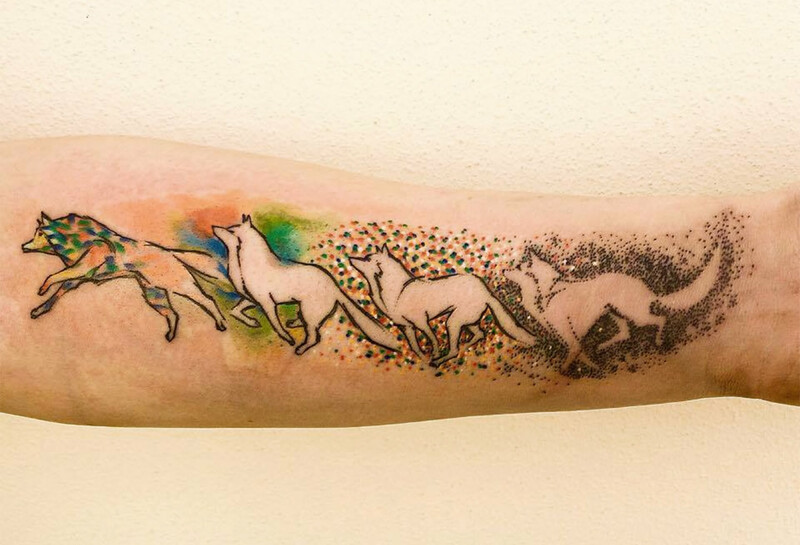 The further the wolf progresses, the more colorful it grows. Ondrash’s loose, gestural style came about by accident. 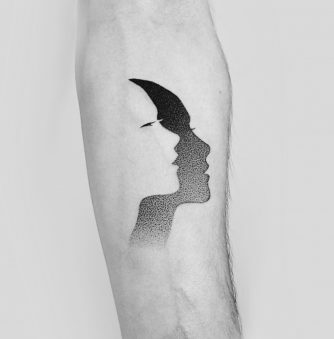 “When my friend wanted a ballet dancer on her leg,” he explained to Inked magazine. “I didn’t have enough time for preparing the design and she came while I was sketching brut figures, and she said, ‘That’s exactly what I want.’ Since that time, I’ve started to get loose, and nothing too static is interesting for me.” Like traditional animation, this piece shows a gradual transition pairing a wolf in motion and flecks of color that continually change. 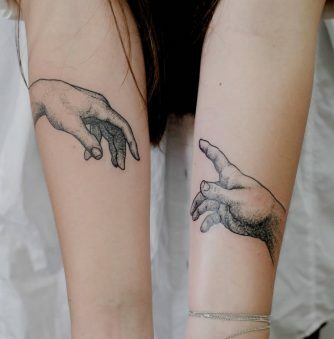 Evan Hawkins would like to try this same idea with other tattoos and more people. 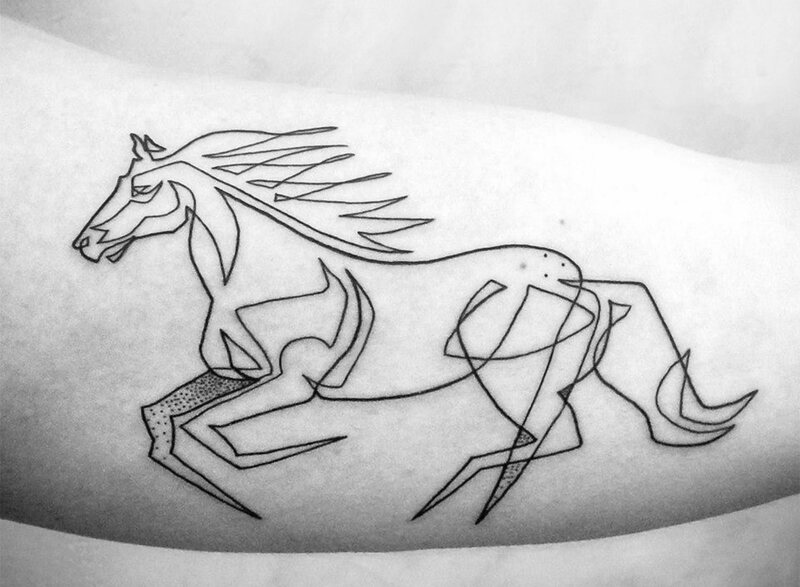 In a direct homage to Muybridge, artist Evan Hawkins organized 10 people to each have a different frame of the famous galloping horse sequence tattooed on their arm. 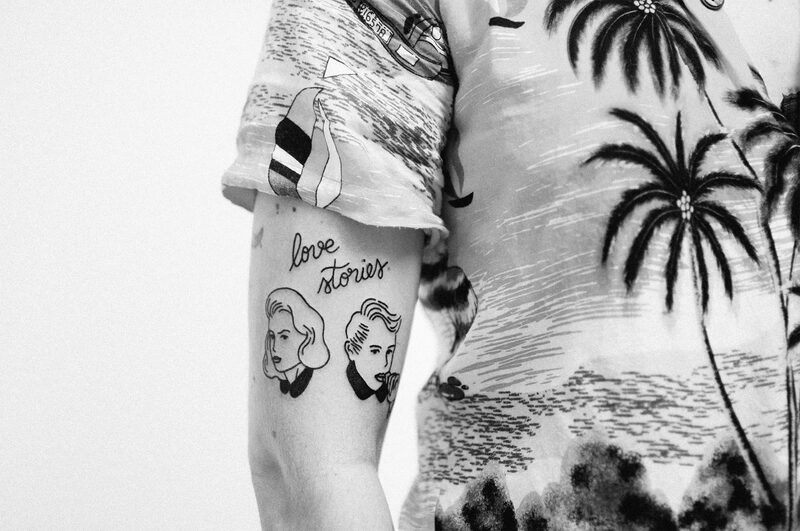 Matt Hoyme spent 8 hours inking the individual scenes onto these people’s arms. 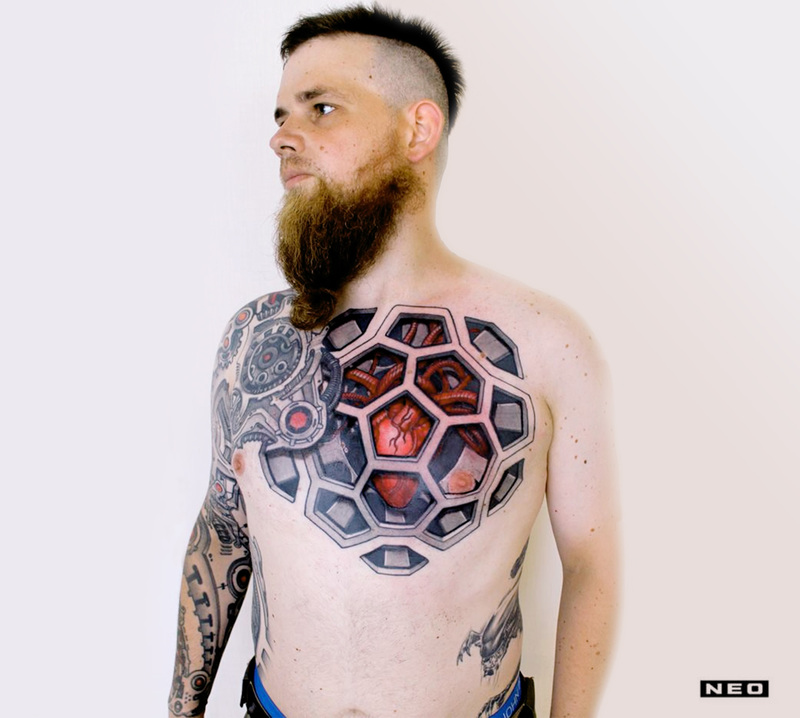 Afterwards, they snapped a photo and compiled them into a single “GIF tattoo” whose smooth, endless loop is a mesmerizing sight. The dotted lines are an ingenious way to convey the passage of time. In comics, one way to show a character’s movement is through a dotted line. 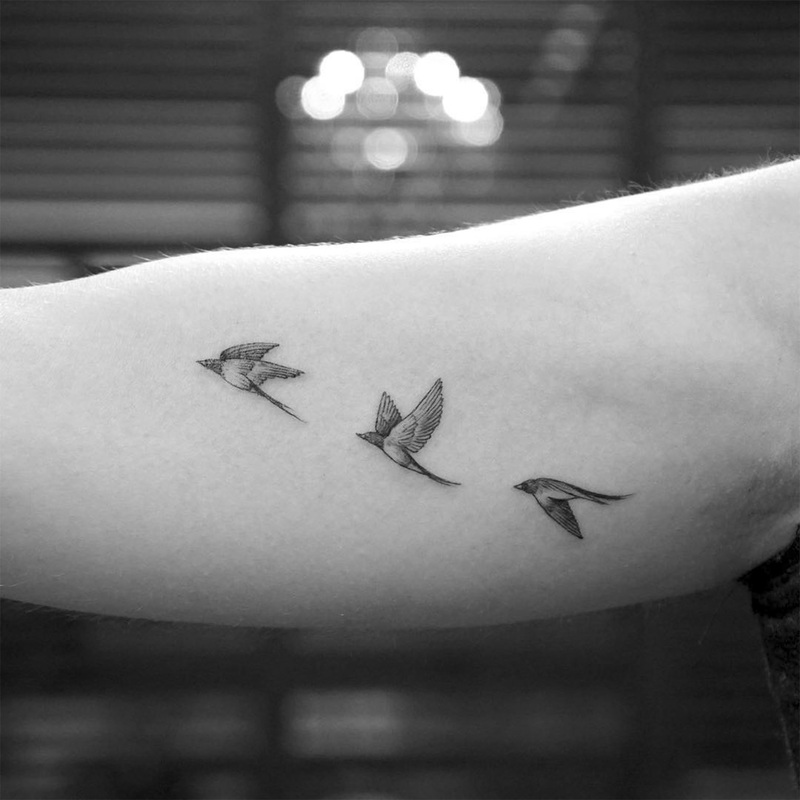 Sarah Herzdame uses this same idea in her animal tattoos. 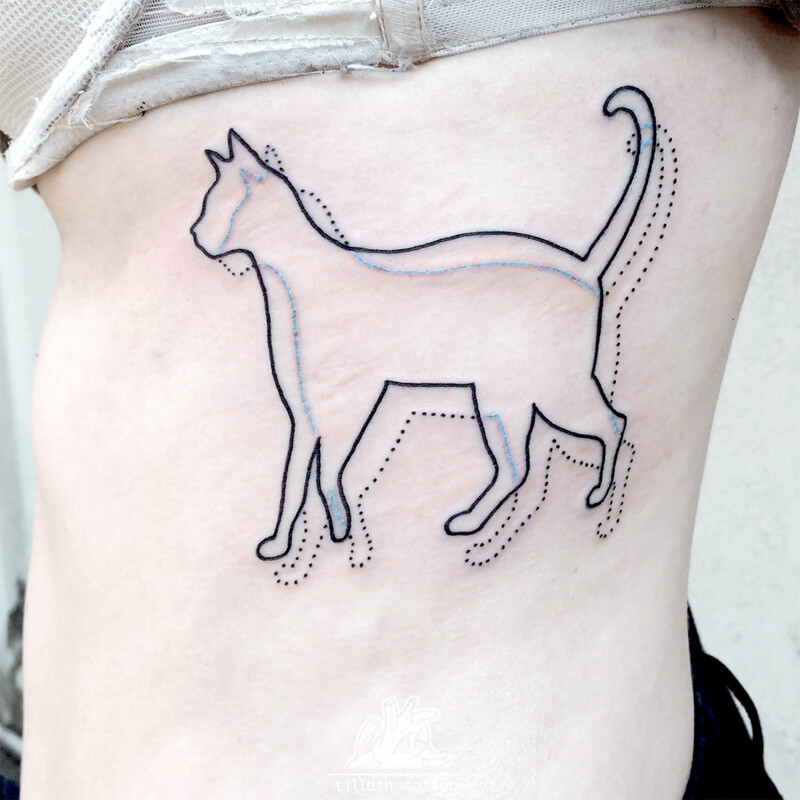 The slight shift highlights a cat’s careful steps while doubling as a striking design element. It has a minimalist touch but shows that you can say a lot with a few well-considered choices. In addition to a cat, Herzdame has also tried this approach with a pony. Three-dimensional animation can bring stories to life, making them seem so real that you could reach into your screen and touch them. Dave “Winston the Whale” experiments with this in tattoo form using stereoscopy, a technique that creates the illusion of depth by combining two photographs (of the same object) taken at slightly different angles. Theoretically, if you were to wear 3D glasses, the red and blue lines would converge into one and give the perception of depth. While it’d be great if this effect worked on skin, Morgan English reports that it (sadly) does not—our epidermis distorts the tattoos too much for them to work. 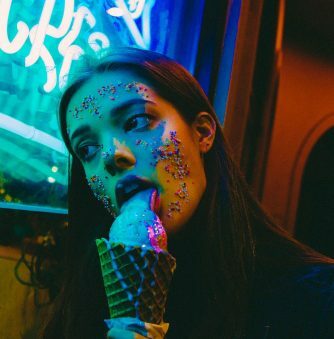 Before becoming a tattoo artist, Pablo Puentes worked with 3D film. 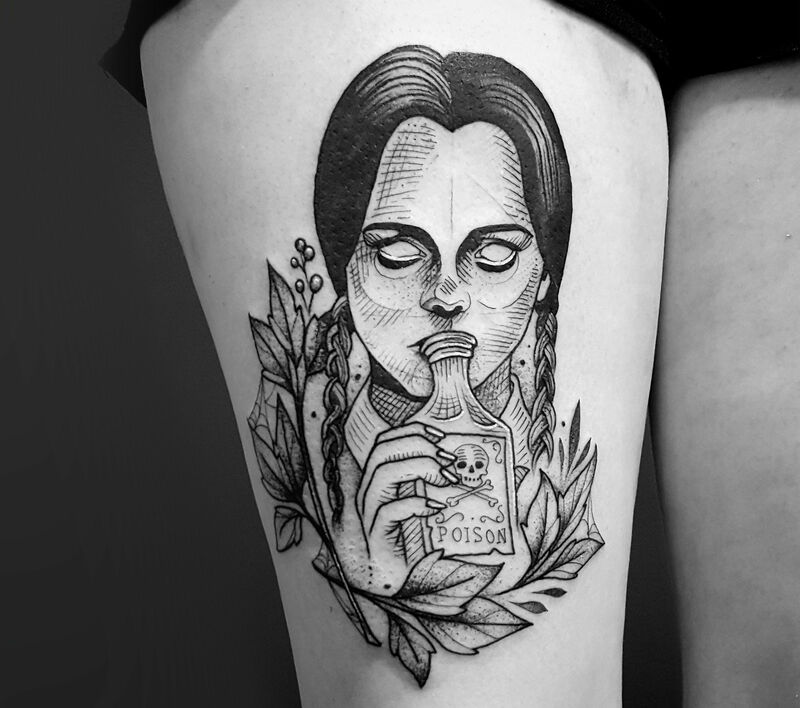 Tattooist Pablo Puentes’ artistic style is rooted in the job he had before body art—previously, he developed 3D film for the entertainment industry. Through it, he gained knowledge of stereoscopic imagery, but this effect ingrained movement and dimensional form into his current imagery. 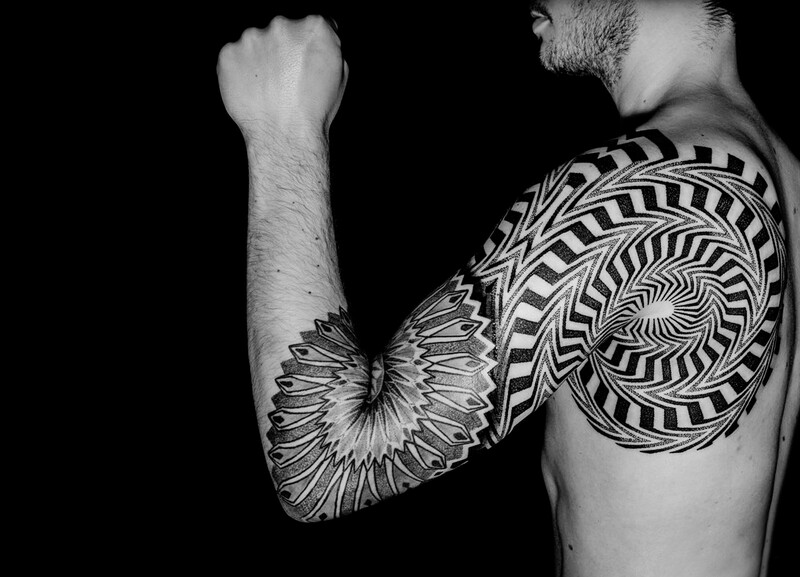 His tattoos utilize scale, distortion, and extreme perspective to create the feeling of motion. As a result, we’ve got the distinct feeling that we’re watching a snippet of a short film. Seeing Op art changed Lewisink’s life and gave him an artistic direction. 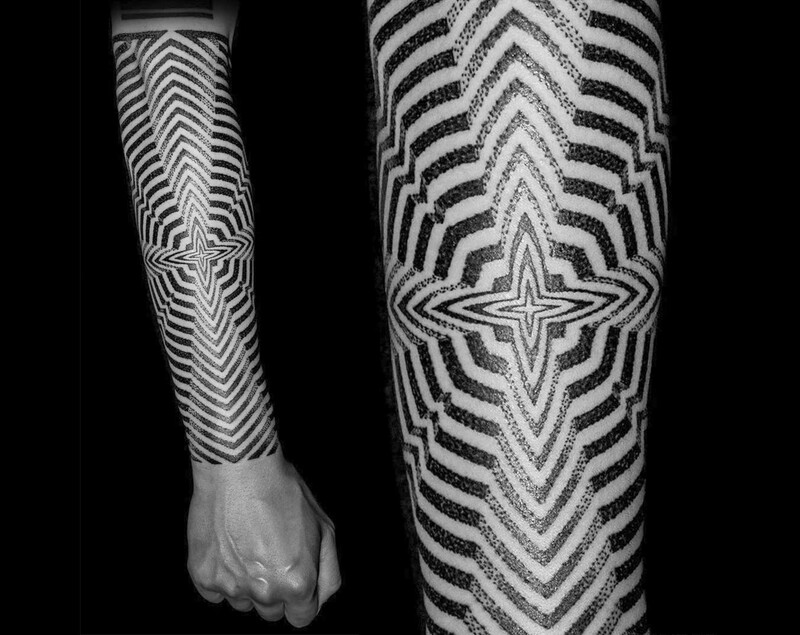 Lewisink creates intricate geometric tattoos influenced from Op art. “When I was 12, I saw a painting from Victor Vasarely, my love for his work never stopped growing and influencing me,” he told houseink. “I remember that day as it was yesterday, and it literally changed my way of seeing geometry.” Vasarely, considered to be the creator of Op art, created “Zebra” which still remains as one of Lewisink’s favorites. 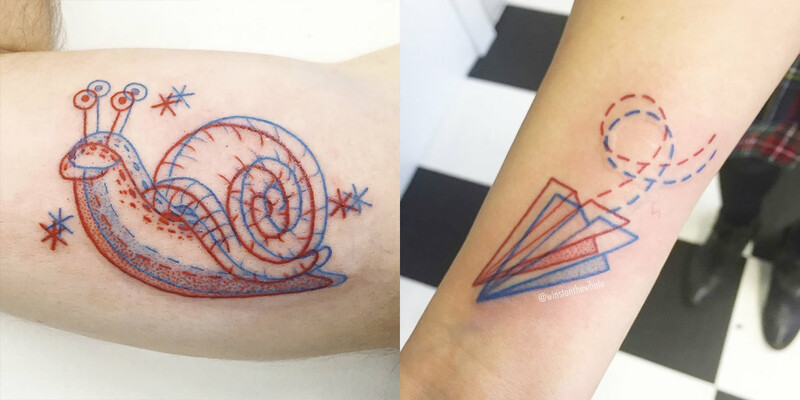 Other artists like Mondrian and Jesùs-Rafael Soto have also informed his mind-blogging style, as well as tattooists such as Filip Leu for the ways that his ink perfectly contour with the body. The spacing between birds is like a long pause—it’s as if these creatures are moving in slow motion.